SANTUBONG: The sound of a dog’s wet snarling with a human arm clenched between its teeth is something that will turn most people’s blood cold. That nightmarish sound came from the car park of Santubong Resort yesterday, where a man and a dog were locked in a tug-of-war with the man’s arm. That canine is Leo Pui’s definition of a good dog. “A bad dog will bite anywhere. A good dog will bite what you offer,” he said, cracking a smile that both reassured and teased. 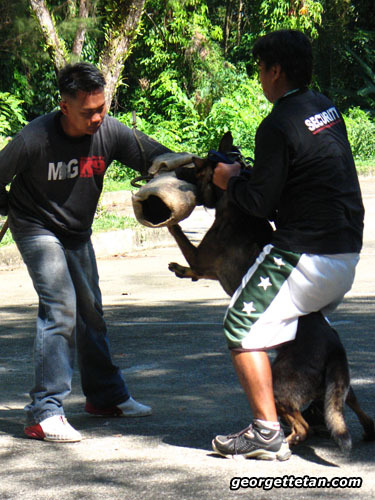 The bear-like man who won’t break into sweat among the big security dogs at this year’s Rainforest World Music Festival (RWMF), but then again, he was the one who trained them. 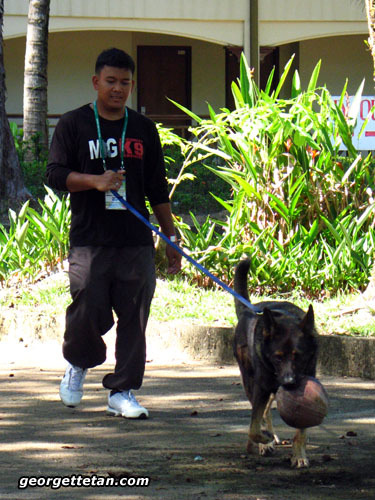 MGuardian Security K9 Services brought in a security team of 63 people and nine dogs this year, doubling the manpower since their initial involvement in the 9th RWMF. “We had 32 men and six or eight dogs. The reason we doubled our manpower is because we are now on duty from morning, mostly on wristband control. Previously, we only worked at night.” said Pui, who is the Operation Manager of MGuardian and Head of Security at RWMF. Pui and his team forms the security team that does crowd control during the concerts and monitor the entrances and exits, both legal and illegal ones, to the Sarawak Cultural Village where RWMF is held in July every year. The festival kicked off yesterday and will end tomorrow. The handler have since gone to rescue their decoy. He had to haul the dog up nearly off its hind legs before it’d let go of the decoy’s well-padded arm. “There are several ways to remove a dog from an arm, but that’s how we do it. 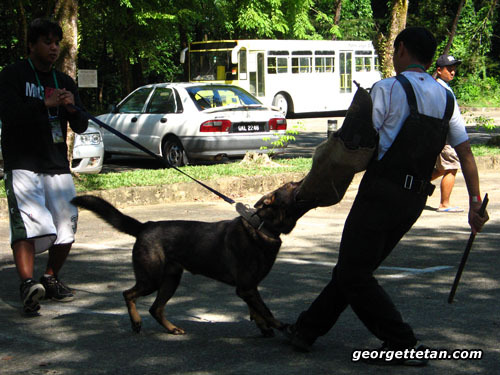 The dog will not let go unless the handler is there and has the culprit under custody.” Pui explained. 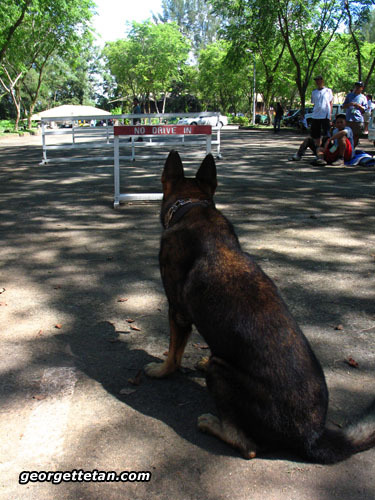 The security dogs, made up mostly of German Shepherds, have one objective when they are let off the leash and pointed at a troublemaker. Get the man down. The handler had his dog back on a leash and was talking to it while its eyed the decoy eagerly. Its breath was coming in loud huffs. 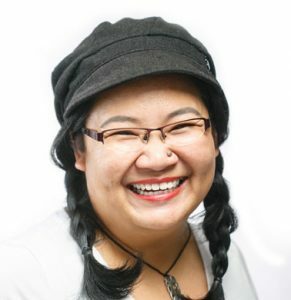 “To these dogs, getting to bite is a reward,” said Pui. He flashed that smile again. Since 2007, Pui has a special treat for gatecrashers and troublemakers that they catch. In their first year, the security team caught and tossed out an average of 30 people, mostly teenagers, who were found without wrist bands. “They’d sneak in through the jungle or staff area.” he said. MGuardian is still performing their normal duties this year. Pui didn’t explain why there is a bomb unit this year, but added that the Police Commissioner will be evaluating their narcotic detection dog. This dog have out-performed drug-sniffing dogs from the Dog Unit in Kuala Lumpur and the CP wanted to see this for himself. The team from Miri have been on duty at RWMF and Miri International Jazz Festival since 2006. Pui also breed their own dogs and mentioned that there is a new litter of puppies sired by the drug-sniffer. He also let drop another fact about breeding working dogs. I was wondering about the dogs that day. Didn’t know it ws about gate-crashers. I tot it wa about drugs.